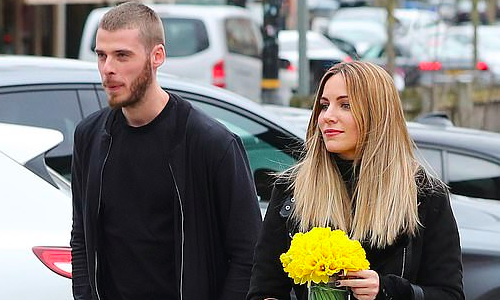 David de Gea celebrated Manchester United’s latest win by enjoying some downtime with his family. De Gea was a part of Red Devils’ 2-1 win over Watford in an English Premier League clash that saw the likes of Marcus Rashford and Anthony Martial find the net once each. The 28-year-old was joined by his fiancée Edurne, their parents and Red Devils’ goalkeeping coach Emilio Alvarez at an Italian restaurant in Hale on Sunday. As can be seen in photos published by Daily Mail, de Gea showed off his athletic frame wearing black jumper over t-shirt of the same colour and brown pants. Edurne, a Spanish singer and TV presenter, looked glamorous in a black jacket and checkered bottom wear as the group made its way back home in a van. De Gea is expected to resume training soon as Manchester United is scheduled to lock horns with Wolverhampton Wanderers come Wednesday.